Five works by Claude Monet helped Sotheby’s set a new high for a London auction of Impressionist, Modern and Surrealist art last night. The 75-lot evening sale generated a premium-inclusive total of £186.5m with 63 works selling on the night (85%). The Monets together raised £55.7m but the sale also offered a further glut of works by leading names in the market such as Matisse and Rodin, as well as some rarely seen material by the likes of Toulouse-Lautrec and an important work on paper study by George Seurat. Sotheby's also arranged more guarantees than before - 12 lots were subject to a guarantee either directly from the auctioneers or via a third-party including six of the top ten lots. Top price of the night came for Claude Monet's Le Grand Canal, a painting from the artist's series Venice scenes from 1908. Estimated at £20m-30m, it was subject to a third-party guarantee and sold towards the lower end of expectations to an anonymous buyer on the phone at £21m. International interest in Monet has expanded in the last ten years, although this work did not appear to attract Asian bidding which may have been hoped. Also making a major contribution to the bottom line was Monet's Les Peupliers à Giverny, a painting of polar trees in Northern France that came from the collection of the Museum of Modern Art, New York and was being sold to raise money for their acquisitions fund. Never offered at auction before, it was estimated at £9m-12m and attracted two phones bidders including the illusionist David Copperfield who was outbid by a US private buyer. It was knocked down at £9.5m. 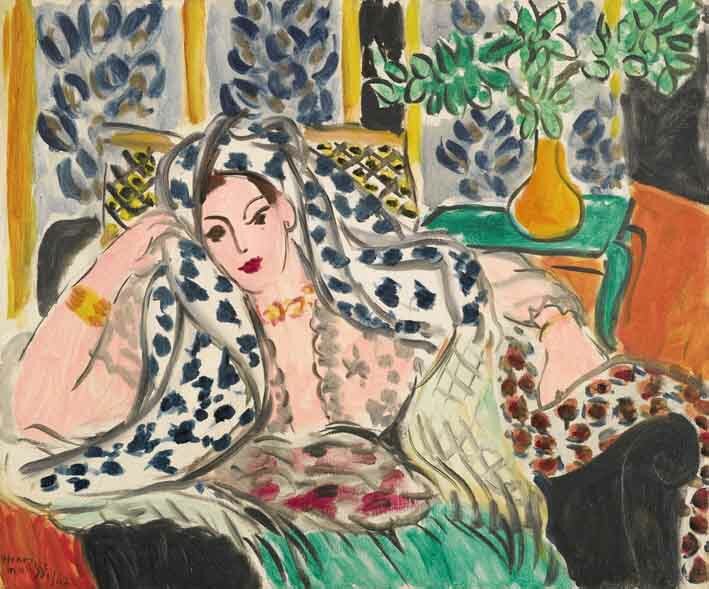 One of the best competitions at the sale came for Henri Matisse's portrait Odalisque au fauteuil noir which attracted four bidders and surpassed its £9m-12m estimate. Consigned by an American vendor who had purchased it for £5.9m at Christie's in June 2004, the painting depicted Princess Nézy-Hamidé Chawkat, the great granddaughter of the last Sultan of Turkey. Here it made a significant increase on the price from 11 years ago, drawing four bidders and selling at £14m to a private collector represented in the room by a private New York dealer. Elsewhere at the sale, Henri de Toulouse-Lautrec's erotically charged painting Au Lit: Le Baiser from 1892 brought £9.5m (est: £9m-12m), selling to a European private buyer on the phone. It had not been exhibited publicly for more than 40 years and only a handful of major works by the artist have appeared at auction in this time. 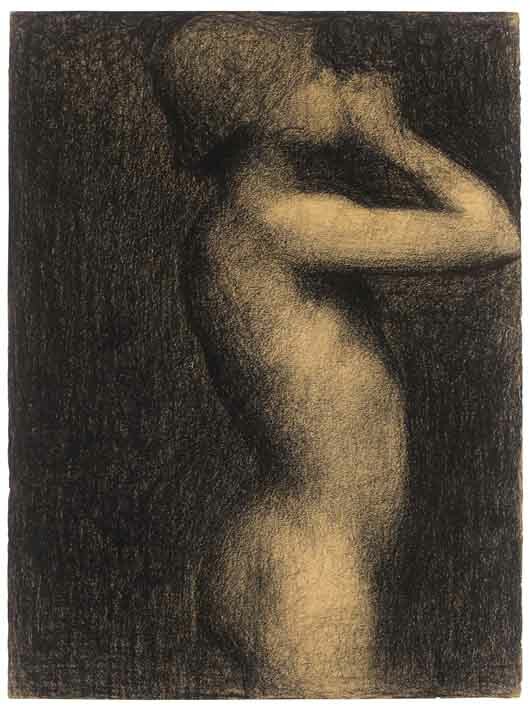 A record came for a work on paper by Georges Seurat as a study for his great painting Une baignade, Asnières which hangs in the National Gallery took £6.8m (est: £5m-7m) from a phone buyer. It was underbid by dealer Thomas Seydoux. Decent bidding also came for a posthumous cast of Auguste Rodin's Le Penseur, which overscored a £3m-4m estimate and was knocked down at £5.5m to Wentworth Beaumont of art advisors Beaumont Nathan Fine Art. 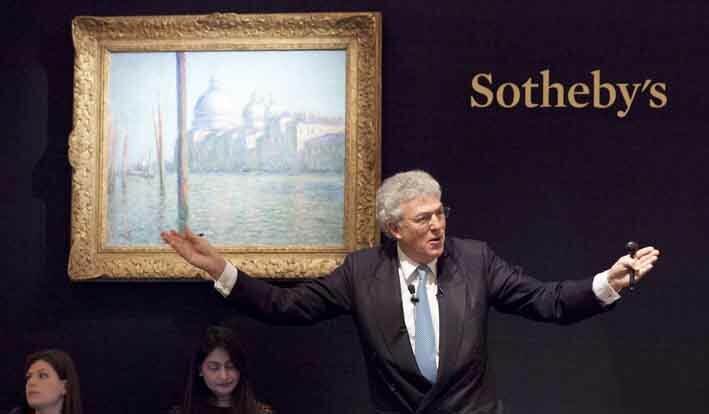 The auction was also the first evening sale in London since Sotheby's introduced their new premium structure, making the prices paid by the buyers even greater than under the previous levels.